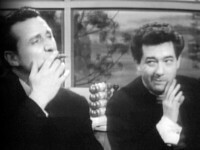 Steed and Cathy search the baggage of the Reverend Harbottle, RIP, which contains a gun, ammunition, and an antique doll with a head full of microfilm. Posing as Harbottle's replacement, Steed infiltrates a very old crime syndicate, Bibliotek. When their dying leader asks his "flock" to vote on his replacement, his assistant, Sister Johnson, does the voting for them—with a machine gun! The plot twists and turns just a couple times too many, and by the end I felt as if I'd tripped on my own shoelaces. Had the plot been tightened up just a bit, this one could easily have earned four bowlers. A great bunch of characters, to be sure. 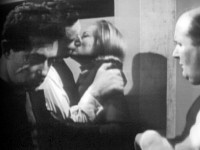 Worth it perhaps just for the only on-screen Steed/Gale kiss! This episode features, courtesy of Harry Landis, probably the only ever use in a thriller series of Polari, a highly camp type of secret slang popularised in the disgustingly funny 60s radio show Round the Horne. In the scene where the "clergy" are playing roulette before lights out, Landis says, "Nanty more bets and we're off! "—nanty means no or nothing. Then, when Cathy breaks in, following the close-up of the door handle turning, Landis nudges his mate and says, "Sid! Varda that! ", varda meaning to look or see. On Round the Horne, whole sentences were often in Polari, e.g., the frequently used "How bonar to varda your dolly old eek" means "How nice to see your pleasant, familiar face." With thanks to Pete Stampede. Also, enjoy the only on-screen clinch between Steed and Cathy, as she must endure playing his girlfriend for a brief time. 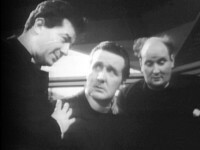 Some scenes were pre-recorded on 2 January 1964 in advance of the main recording. Sister Johnson (Lois Maxwell, a.k.a. Miss Moneypenny of 007 fame) pops out from behind a sliding chalk board and wastes the sleeping crooks with one monster of a machine gun!